Rewards Canada reader Jim M. provided a comment on our post Travel Hacking 102 - Earn up to 4,300+ AIR MILES Rewards Miles for FREE with a potential value of over $1,300 in travel (Updated Nov 21, 18) and how he has leveraged just one of these offers for an amazing redemption story. This ties in perfectly with our latest Ultimate Credit Card Portfolio that came out earlier in the week that focuses on companion passes! We'll pass it off to Jim now! 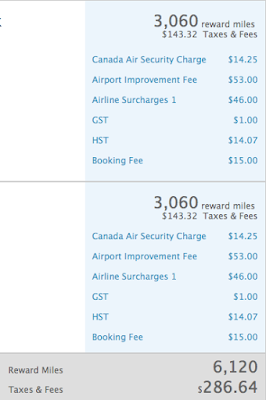 Here is a good example of how we have been able to receive amazing value from AIR MILES. I applied for the BMO AIR MILES World Elite Mastercard last month. It offers first year free, 3,000 AIR MILES Rewards Miles on a minimum spend of $3,000 which in turn produces 3,300 Air Miles. The card also brings a 15% reduction in AIR MILES award flight mile requirements for travel within North America and a one time free companion benefit. I received the card and am in the process of completing the minimum spend. Last week I booked return flights between Sudbury and Vancouver for the spring. The mileage cost was 7,200 Air Miles for two, reduced by the 15% the card provides so in the end the redemption was 6,120 AIR MILES Reward Miles.. The companion benefit will see 3,060 miles returned to my account so the net miles cost is only 3,060! That’s 240 less than the sign-up bonus on the card and the earnings for the minimum spend. The taxes and fees for two return tickets YSB-YVR were $287. 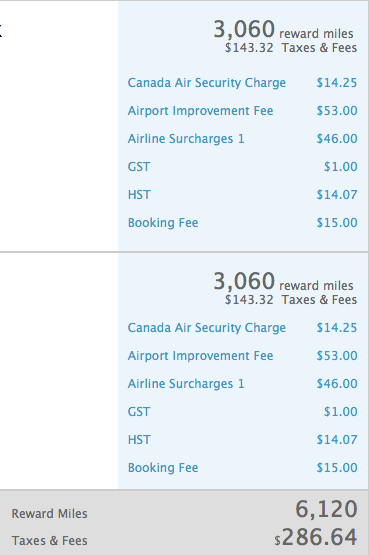 The lowest price I could find for two between YSB and YVR return flights on the same dates of our travel was $1,471. The immediate dollar value of the miles earned from this card is therefore $1,184! Not bad for one card, not bad for our tertiary travel program. In the end we are receiving about 39 cents of value per AIR MILE on this booking thanks to the companion voucher. AIR MILES, used carefully, is a very valuable option for ‘free’ travel. This kind of specific use of AIR MILES allows us to save most of our Aeroplan Miles and British Airways Avios for long haul, intercontinental Business Class travel which is where the real value of those programs lies. We also save Avios for travel within South America where LATAM doesn't have scam charges. Qantas is similar in Australia for us. When we get new cards we tend to concentrate all our spending on the new card until minimum spend amounts have been reached. All our spending, even a Starbucks coffee, goes on that card. We occasionally plan to get a new card with a high minimum spend just in advance of a major payment. I pay off our cards daily online from our bank accounts and almost never carry a balance on a card. It is the easiest way to manage them and ensure we never miss a payment. We do not use any manufactured spend techniques to meet our minimum spend requirements. This redemption story from Jim provides insight to an often forgotten value of the AIR MILES and even the Aeroplan program. That is using miles and points for domestic flights out of smaller Canadian cities that tend to be expensive to fly out of. Sudbury is a famous one that always shows up on forums like FlyerTalk. Basically any small town or city that has only one major airline serving it tends to be more expensive which equates to better value for your miles and points, even more so than for international flights and remember it doesn't take as long to collect enough miles for most domestic flights!